Tahnee sure knows how to plan a good time. 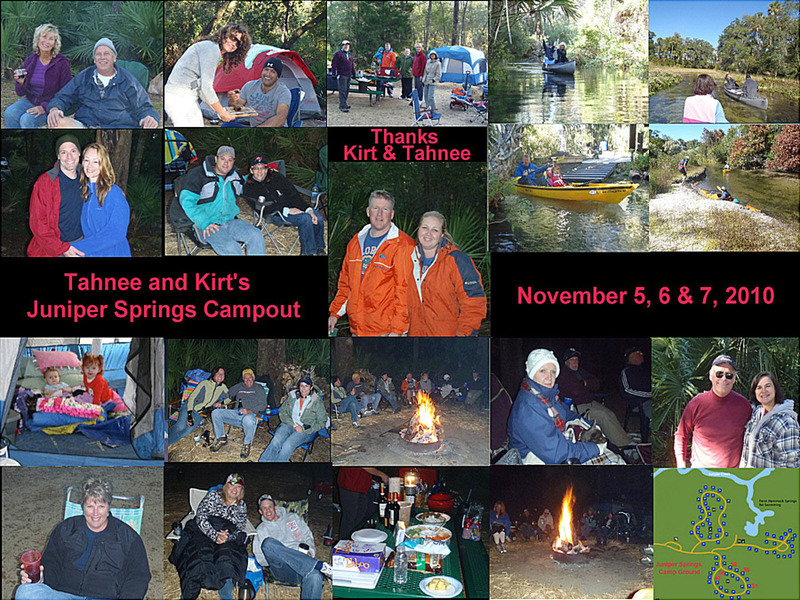 Camping out and canoeing/kayaking Juniper Springs Creek was a blast. All one had to do was go by Tahnee & Kirts campsite or Carlos & Claudia's campsite and enjoy being pampered. Getting enough to eat and drink was not a problem. Getting too much to eat and drink was the problem but also the joy in having a good time. Fire builder Mike was amazing. He kept the fires burning high and brightly and warmed up the place. Yes, it got down into the high 30's so we needed those big pit fires. Warming up around those big pit fires we had a wonderful and social time. Going down Juniper Creek was a learning experience. After 4 hours of zigging and zagging down the river, smashing into almost every thing and rolling over, we will have enough funny stories to tell for a long time. Thanks Tahnee and Kirt for a fun filled-social weekend.